Pad Thai was a cheap and filling option when Thailand faced difficult economic times in the 1930s. Add vegetables, beansprouts and pieces of protein and voilà, one has a nutritious meal. 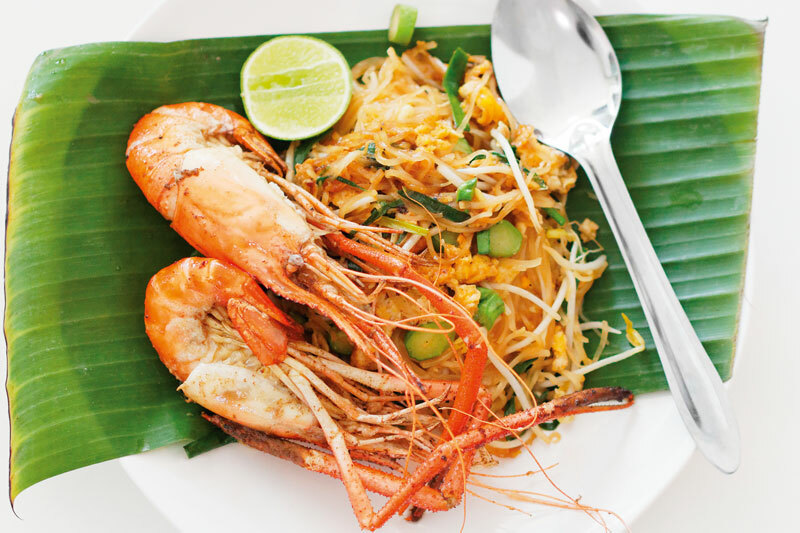 Pad Thai is a dish that’s probably the best representation of Thailand. Known worldwide for its distinctive rich flavours, the stir-fry noodles are served in a perfect feast of colours and bursts of tastes with just one bite. Pad Thai becomes a healthful choice with the accompaniment of crushed peanuts, fresh chives, bean sprouts and a squeeze of lime. Phukvarun Watchmon, a sous chef at Benjarong restaurant at Dusit Thani Bangkok, shares with us her secret recipe and inspires everyone to try authentic Thai flavours. When trade show Food and Hotel Thailand 2008 held a competition, Chef Phukvarun won the cooking contest for Fusion Free Style. She always strives to learn the culinary art and gain experience in her food adventure. She specialises in combining modern techniques with traditional flavours to create contemporary dishes, yet the results are distinctly Thai at heart. Pad Thai is also a signature dish for the Dusit Thai Cooking Class at the Dusit Thani hotel in Bangkok and is a favourite recipe to learn. Guests can join a Thai chef de cuisine for an informal hands-on cooking experience where the mouth-watering secrets behind authentic Thai ingredients and cooking tips are unveiled. This class experience also deals with premium ingredients sourced locally and internationally to create a superb taste and enjoyment.